We re- tarted The Church of England's new Pilgrim Course in September 2016. Sessions take place in Great Wilbraham. The day includes a delicious lunch and the opportunity to meet our parish organists. A panel of married couples answers questions in the afternoon. We try to create a relaxed atmosphere and private space for couples to chat together using the course material provided as a springboard. Couples being married in this benefice have valued the time together and the chance to reflect on and develop their marriages. The Marriage Preparation Day takes place in January. All couples being married in this benefice during the following year are invited to the event. The next Preparation Day will be on January 30th, 2016. Occasional short courses are run throughout the year exploring Christianity. We also run a regular Lent course in the weeks leading up to Easter. Several small groups have been formed in our benefice over the years for Christians to learn, share and grow together in faith, hope and love. Although these groups are independent of the churches, many members of our congregations have found them hugely valuable. 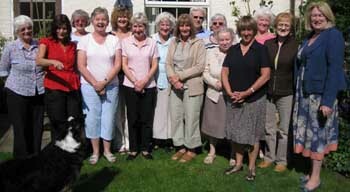 This daytime group is run by Ann Neale. It offers a space for pastoral care and fellowship for folk in our villages and a place to get to know people from the church informally. The group meets on the first Monday of each month at 10.30, finishing at 12 noon. We run occasional retreats to enable members of the parish to find time to relax, pray and reflect together.